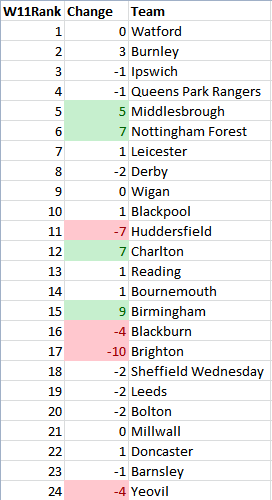 I’m slightly short on time for the rest of this week because I’m off to Dublin for the weekend, but enough of you asked for the updated English Championship rankings from the predictive model, that I was moved to post them. If you have never read one of our predictive model pieces, check back here for a fairly thorough intro. One thing to keep in mind is that the model neither knows nor cares how many points each team has in the league table (though we attach them once points start to matter in who might actually finish where at around the halfway mark in the season), so some things might look very strange right now. That is to be expected. It also doesn’t know how much teams spent on players and payroll, so if a team is punching above or below their weight here, it’s on statistical merit alone. At the top, the picture is pretty clear. Watford are the best team in the model , followed by Burnley. Burnley’s striker pairing of Ings and Vokes – who work as a comedy duo during the offseason – are notching damned impressive numbers. Check them out if you see a Burnley game on TV, they are worth a watch. If I’m honest, it feels like QPR are sandbagging. Only 2 goals conceded in 10 matches is ridiculous, but that team should be scoring a lot more than they are. It feels like Harry has told them they absolutely must be solid defensively, and that’s costing them at the offensive end. This is weird, because in the past Redknapp has been a fairly indifferent defensive manager (as indicated by his yet-unpublished manager fingerprint), while pretty much letting his talent figure it out on the offensive end. Given the money disparity, QPR should be walking away with this league. Statistically they are fine, but Watford and Burnley are definitely better. A quick note on Derby: their coefficient is in flux since they fired Nigel Clough. Under Clough they were doing pretty much everything right statistically except winning the games. Under McClaren – well, we’ll see. It takes 5-6 matches before teams stabilize enough to have any clue as to how they will look. At least they have Barnsley to keep them company? Bolton’s surface shot dominance looks okay, but they have real issues when you dig deeper, especially on the offensive end. Jermain Beckford (29!) is never the answer to fixing a team’s offensive woes. Neither is David Ngog. Bolton have both and could desperately use a loan or two up front from the Premier League. As you can see in the chart above, I’ve noted how much teams have moved up or down in the rankings. In the coming weeks, I’ll likely add this to Tableau for a prettier graphical representation, but for now you get the lazy version. As mentioned before, there is fairly reasonable volatility in the early weeks, but from here on out things will settle down quite a bit. Due to clustered coefficients, it’s not that hard for teams to wiggle around in the center of the rankings, but it gets tough to break into either the very top or bottom of the table without exceptional performances. Birmingham, Charlton, Forest and Boro were the big positive movers this time, with both Birmingham and Charlton leaping out of relegation range, and Boro and Forest showing themselves as playoff candidates. On a marked downward trend are Brighton, Huddersfield, Yeovil, and Blackburn. Yeovil were already worryingly bad before, but have plunged all the way to the bottom. The silver lining is that they can’t drop any further (though their coefficient can)! Brighton went from playoff candidates to middle-of-the-pack stragglers, and Blackburn once again look like a team where Jordan Rhodes (9 goals already) will keep them afloat, even if the rest of the team is pretty meh. Huddersfield looked very much like the little team that could initially, but they have come back to the pack and are dead average overall (but very good defensively).